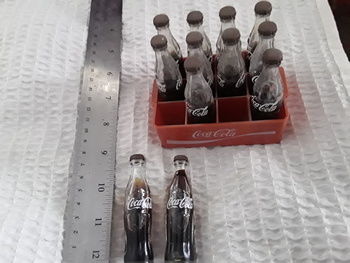 Miniature Coca cola bottles and crate. 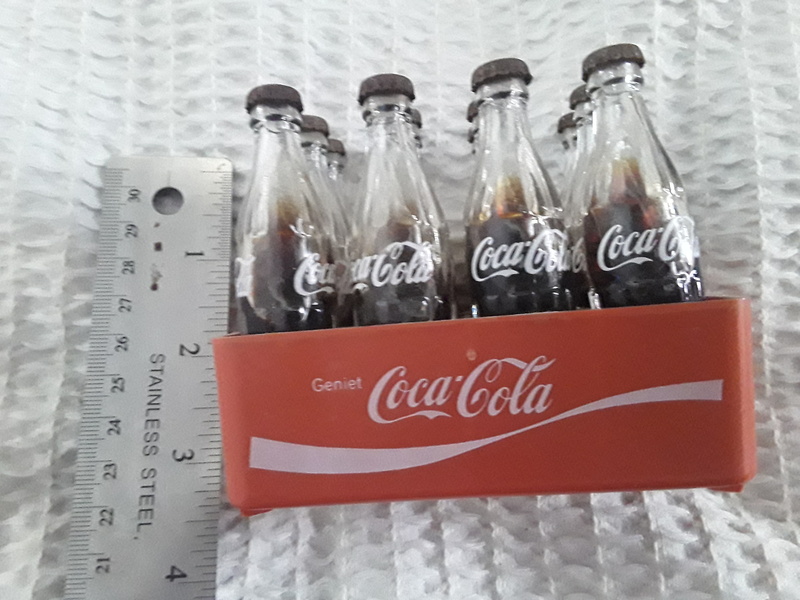 Apparently when you returned your coke bottles to the store you would receive a mini one back. These have never been opened and are South African. Nice novelty piece. Wow! I wish that practice was done in USA when you took your empty bottles back! We only got 2 or 3 cents. 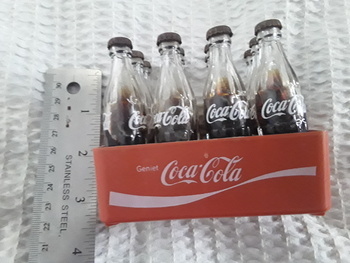 Neil, I looked online and found dozens of sources for the miniature Cokes with their cases or cartons. I didn’t check on ones that are South African though. So, I’m thinking that they are not rare. But they certainly are cute and realistic looking. 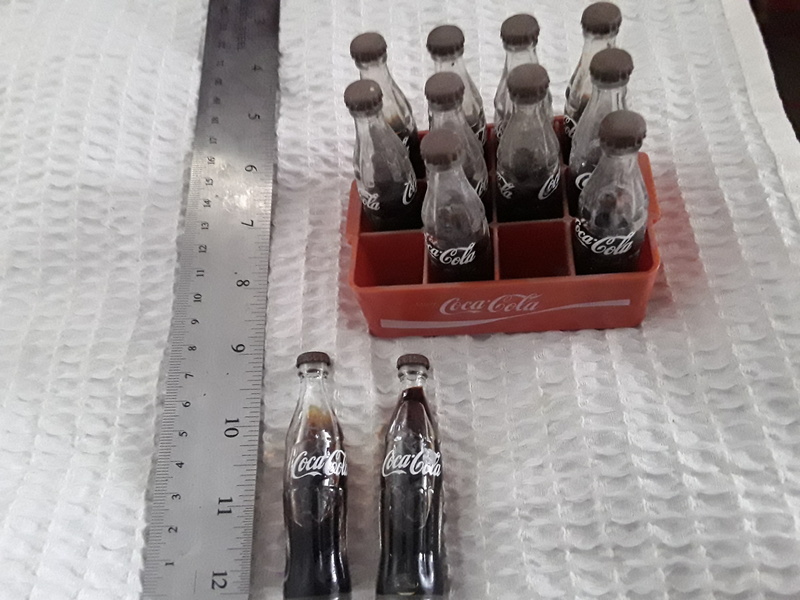 I forgot to ask where the info of getting a mini Coke back when you returned empty bottles came from. Perhaps that was some promotion for buying Coke somewhere but I had never heard of it around where I live. 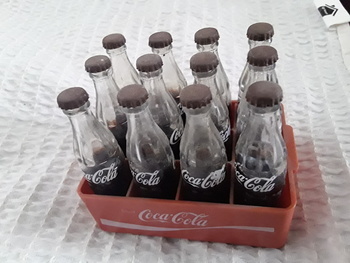 Everyone I ever knew or shoppers at my dad's store who bought Coke just were too frugal or just couldn't afford to pay the deposit for the bottles--it was in your best interest to bring back some empties. From working in my dad's store, I got to know those children (and entire families) who scoured the roadsides for empty bottles that they could bring in so they could get a few cents back on each of them. That was back in the day of penny candy. He kept the penny candy on the bottom shelf of his candy rack so children could see it. 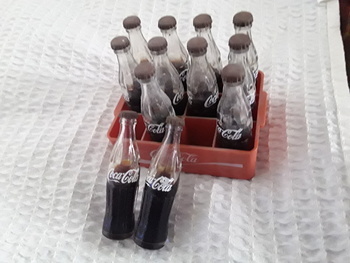 A child with an empty Coke bottle could bring it in and then leave with 2 or 3 pieces of candy. Some children would mull over their many choices, considering which pieces would last the longest. "Good" choices were BB Bats (taffy on a sucker stick), or bubble gum, as I recall.